Everybody loves a good meatball, but not everybody likes making them. For some, the thought of a frying pan filled with little sizzling spheres splattering in their own grease keeps meatballs off the menu. Luckily, there is another option. If you liked the Meatball Grill Basket, the Meatball Baker is right up your alley. 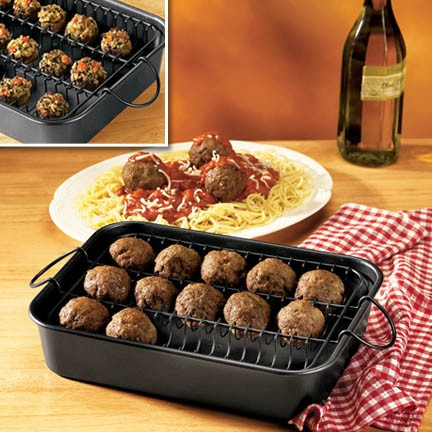 Basically a roasting pan with a special rack, the gadget keeps meatballs elevated, allowing for fat to drip away from the food. Featuring three rows that hold the meatballs in place, the nonstick carbon steel pan measures 10-inches by 13-inches with a depth of 2.5-inches. The insert itself is 9-inches by 11-inches and can be used for much more than meatballs. With the rack and pan set having the ability to keep food raised above dripping grease, the opportunity to dig deeper (and greasier) into previously avoidable recipes is just too good to pass up. So dust off that old cookbook from a time when fat content didn’t matter and get to exploring!